"This is a healthy, delicious, easy dinner! The best part is that it cooks all in one skillet so there is hardly any mess!" Heat the olive oil in a large skillet with a lid over medium heat, and cook and stir the chicken and garlic until the chicken is no longer pink in the center, 5 to 8 minutes. Pour the wine and diced tomatoes with their juice into the skillet, and bring to a boil over high heat while scraping any browned bits of food off of the bottom of the pan with a wooden spoon. Stir in the shell pasta, and return to a boil. Cook uncovered, stirring occasionally, until the shells have cooked through, but are still firm to the bite, about 10 minutes. Spread the spinach over the top of the pasta, cover, and simmer until the spinach leaves are cooked, about 5 minutes. Sprinkle the mozzarella cheese evenly over the skillet, and simmer until the cheese has melted and the pasta is bubbling, about 5 minutes. 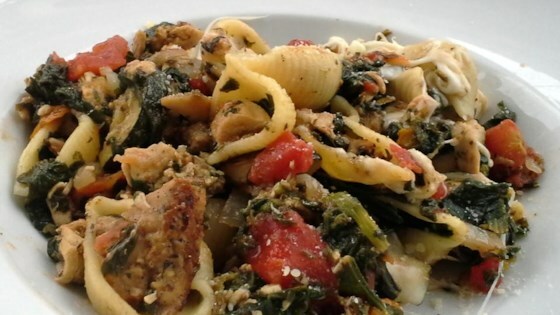 See how to make an Italian-inspired, one-skillet chicken and pasta dinner. If you can't find seasoned tomatoes, you can use plain tomatoes, and add a teaspoon of dried Italian seasoning. Yum! My picky husband loved this. I used whole wheat pasta and increased cooking time and added about a cup of chicken broth to prevent drying and scorching.